Visiting the West Michigan area is such a treat as it is filled with wonderful small towns, each with its own unique character and history. Each of the towns and villages in our part of Michigan offer a host of special attractions like festivals and events, terrific shopping, outdoor activities and more. Spend some time touring these small towns to see all that we have to offer. Ludington is a favorite destination in Michigan. 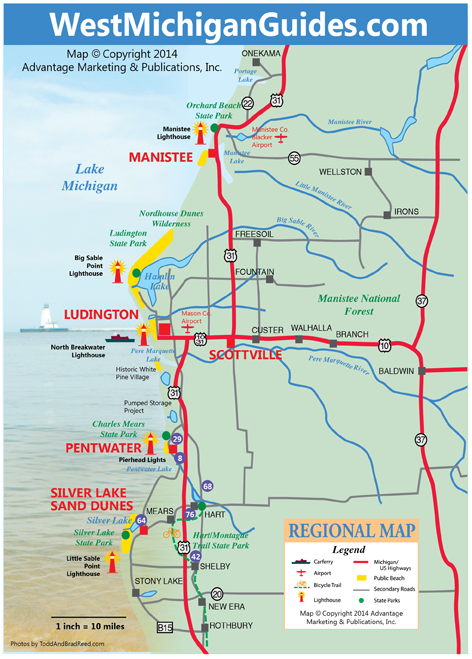 Miles of clean, sandy, beaches...lighthouses...S.S. Badger carferry...and the Ludington State Park are just some of the reasons why. Almost every weekend in the summer features a festival, art fair, or fishing tournament. Romantic sunsets for just the two of you, or a great family vacation--everyone just seems to love Ludington, along the shores of Lake Michigan. Hamlin Lake Located four miles north of Ludington, Hamlin Lake is truly a lake for all seasons. Numerous cottages and resorts are situated near the water, and anglers love to venture out all four seasons for great fishing. At more than 12 miles long and 5,000 acres large, it's the perfect place to jet ski, canoe, kayak, pontoon, or tube. 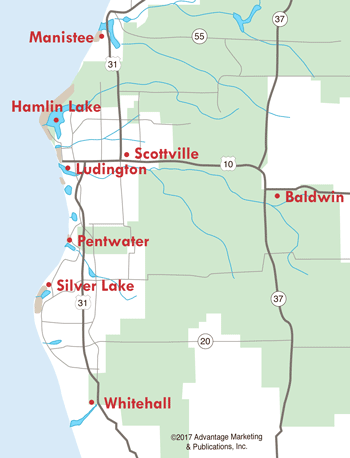 Pentwater, just a few miles south of Ludington, is situated on Lake Michigan and Pentwater Lake. This community is a vacation paradise complete with historic village charm, beaches, boating, fishing, distinctive shopping and a variety of dining and lodging facilities. Scottville is the home of two "famous" attractions: the wild and zany Scottville Clown Band and the Western Michigan Old Engine Club. The Scottville Riverside Park on the Pere Marquette River has over 50 full service sites plus a swimming pool...perfect for tent and trailer camping. Silver Lake offers 2,000 acres of sand dunes to hike and enjoy. Explore the dunes aboard a dune scooter tour, or rent an off-the-road vehicle and head out on your own. Don't miss the century old Little Sable Lighthouse, a favorite of artists and photographers. Hart is the location of the trail head of the 22-mile Hart-Montague Bicycle Trail, Michigan's first linear state park. Manistee is a Victorian port city along Lake Michigan. In the downtown region, you'll find the 1.5 mile Riverwalk, as well as the historic Ramsdell Theatre. The Manistee National Forest attracts thousands to its natural habitat for biking, hiking, or camping. Terrific charter fishing, numerous golf courses and a nearby casino make Manistee a visitor's dream. Fountain-Freesoil are two communities that capture the essence of small-town life. From tree-lined streets, to quaint business districts, to the surrounding countryside perfect for a summer's drive or bike ride, these communities are what small towns are all about. Walhalla, located on US-10, is the home of the Manistee National Forest on the banks of the Pere Marquette River. Canoeing and tubing on the Pere Marquette is hard to beat, and hiking through the forest is a delightful experience. The Manistee National Forest offers excellent year-round activities such as hiking, biking, cross country skiing, snowmobiling, bow hunting, and small game hunting.